Yesterday was a happy day. My Nicolette Mason for ModCloth order showed up at my door, and I couldn’t have been more thrilled! I picked three pieces, two of which I’m wearing in this outfit. Check out this video of Nicolette and her “girl gang” of fashion bloggers modeling some great outfits from the collection. While I’m drooling over the party dresses, I decided to choose pieces that I would wear the most often. And, of course, I had to get this coat. Since I started shopping at ModCloth, my wardrobe is starting to fill up with retro clothing. Before then, retro really wasn’t an option for me because I couldn’t find anything of that style in my size. 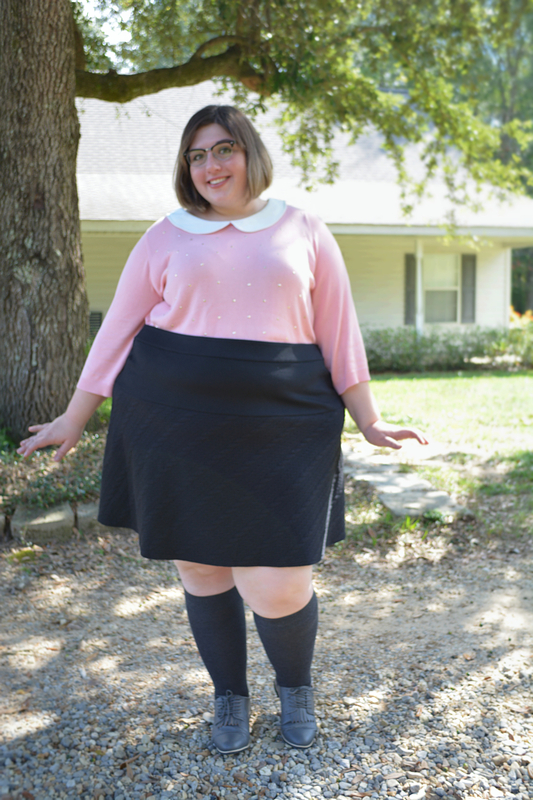 I’m so glad they along with Pin Up Girl Clothing and Gwynnie Bee carry clothes reminiscent of the ’50s and ’60s , and through my blogging buds of all sizes, I was able to find them. 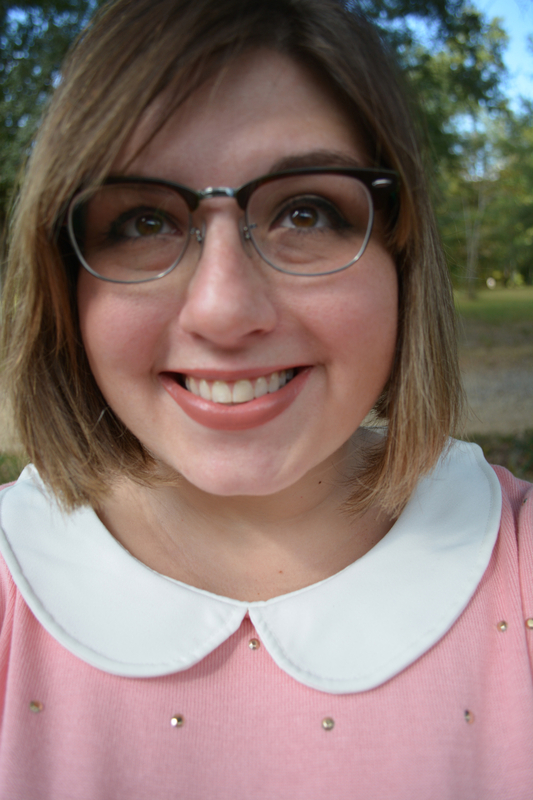 I mean, I’m wearing freakin’ Peter Pan collar, and I think that’s awesome! The detail in the skirt is adorable, too. The design mimics knitted cables. I still say I’m going to knit a skirt myself from this pattern from Knitty, but the one I’m wearing here will hold me over until that happens. Also, the fabric is stretchy and soft, and even though it’s short, the cut doesn’t leave me feeling totally exposed. How about you all? Have you worn anything from ModCloth’s Nicolette Mason collection? Let me know in the comments! This outfit has brought some cuteness into my life. It reminds me a little bit of Clueless, and I’m all for that. Thanks for visiting me today, and I’m outie! We love this look on you. Too cute! aww thanks. Yes we had fun.. and we meet great funny girls along the way. We seriously love the new hair cut. It looks great. That sweater looks soo cute on you, and I can’t wait to see you in the pink trench coat! I really loved a lot of things from her new collaboration, but haven’t purchased anything from it myself. I loved her promotional video with the girl gang, too. Thank you! I know you from Instagram, correct? That’s what I thought when I saw it, too, lol! 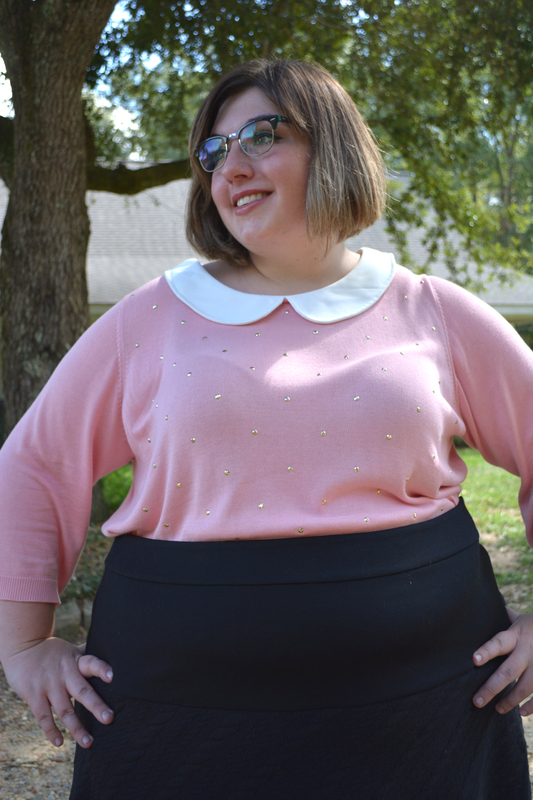 Omgosh, when I saw that top as a new arrival on ModCloth, I instantly added it to my love list. I’m in love! It’s so beautiful, and you styled it perfectly. Those glasses totally match you, too!